A massive thank you to everyone who reads and follows my client catches and personal fishing posts, my reviews and general bass related exploits – I really, really appreciate your support. I do put my reels through hell out on the coastline, and although I wash them after use, I know deep down that the inevitable larger wave, knock or drop will more often than not render them ‘less smooth’ than when they were taken out of the box… Not so the Daiwa – not yet anyway! Costing £155 and weighing 215g, I’ve been using it since mid-September which admittedly isn’t a long time however, it has seen some serious ‘action’ and been splashed, bashed and dropped on a number of occasions, yet it is still running beautifully. So why did I buy it you ask? I wanted something offering a little more protection (the Mag Sealed technology repels rather than completely protects) and ultimately, I was really missing a reel with a ‘T’ shaped handle (something my other reels don’t have). I was put onto it by Jansen Teakle (Veals Mail Order Manager and Bristol Channel Guide) and I’ve got to say I’ve been really happy with the EM MS2500. You can buy the slightly heavier/larger 3000 size here as I think the 2500 is now getting very hard to obtain – but if anyone can get hold of one, it’ll be Veals I’m sure. Having switched over to a relatively large Nikon D5000 SLR camera in mid-October, I needed something that would offer complete protection from the sea and the rain! I searched about and found these excellent waterproof bags here. Retailing at £49.99 I bought mine for £34.99 (they are currently at this price) which is a very good deal I think. The design is very simple (you effectively roll the top down) and it withstands a proper drenching and even a dunk in the water according to Overboard. Impressively, it’s showing no ill effects from being strapped to my back or dumped on the rocks for hours on end! Furthermore, the 20 litre bag (there is a 30 litre version) I’m using will easily swallow a lightweight jacket, 2x lure boxes, a flask and my camera bag – with room for snacks, a small First Aid kit and a 30m rope. The reflective tape is, of course, very useful at night, and the bag is very comfortable when trekking around the SW Coastal Path and more importantly, across the rocks. Moreover, it sits snuggly in the arch of your back and tight to your chest (a good thing) so to not move around too much. A solid piece of kit that is miles better than a standard rucksack. A diminutive lure weighing 10g and measuring 95mm that you can buy here, it saved my clients and I from blanking on a number of occasions during 2017. With a diving/swimming range of 10-80cm, the bass below (and many more) were caught in darkness when, I believe, the bass were sensing vibration (via their lateral line) or hearing the rattle (using their earstones or otoliths) to home in on the ‘Squash’ when there was virtually zero ambient light. I admit, any lure with these characteristics could have had the same effect, but confidence in a particular lure is everything, and when it is REALLY dark, if the bass aren’t biting I turn to one of these. Strangely perhaps, I haven’t caught a bass on one in daylight (I have caught bass on the larger 125 version) but that doesn’t matter to me! Two further points: They cast amazingly well – even into a headwind and (another of my theories sorry!) I reckon when a bass senses or sees a small disoriented ‘fish’ out in the open like this, it doesn’t even bother slashing at it (as bass do) with its gill plate and will instead, just engulf the lure in one solid hit/take – no messing about is just what you want! The Black Savage jacket (retailing at £119.99 but available here for £79.99) has performed exceptionally well in hot/cold, calm/windy, wet/dry conditions throughout 2017. The figures proclaiming the jacket is 100% waterproof are almost spot on. When I’ve been out in the rain all day the sleeves do become slightly damp (moisture running down my arms when casting?) but the main body does remain dry – so much so that I’m content to leave my mobile phone in the inside pocket. Additionally, I have found the jacket to be highly breathable even during long walks on a hot days. As I wrote in a recent Total Sea Fishing article, I like the dull green colour and subtle graphics as I really don’t want to stand out to the fish! The hood is detachable and I particularly like the wired peak. The waist area can be drawn in nice and tight if required, and I also find the velcro sleeve fasteners very comfortable and reliable. How could I possibly leave out the lure that was responsible for my personal best bass! The version I use is not the SSR (Super Shallow Runner) and the colours I like are the Black Back Flash (above) and the Ayu – I just love them! The Vertice will cast up to 71m and ‘swims’ very enticing in that deadly zone of 30-120cm. What’s more, there are very few lures (that I’ve used anyhow) that will cast and swim as consistently as one of these. If you’re faced with swell and the wind down your throat, then attach one of these and blast it out there! 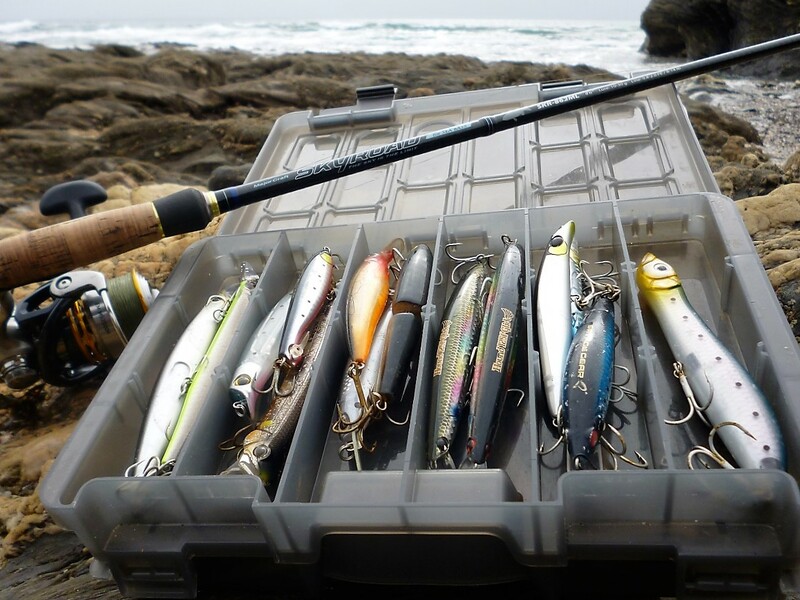 Not many places stock them, and either Ebay or the superb online tackle store Lure Fishing For Bass is your best bet – but it’s worth the effort tracking them down – trust me. It isn’t 8 strand and on reflection I don’t think it’s anywhere near the claimed 0.06mm in diameter (more like 0.16mm) in relation to the 20lb braid I use. In the course of the 2017 season, I dabbled with the dark/moss-green versions/colours of the Varivas Super 8 PE and Savage Gear Silencer respectively and both are excellent. But… I am always drawn back to it for one very important reason – abrasion resistance. Nothing I’ve used (so far) is capable of withstanding the kind of terrain I am routinely fishing and guiding over like the ‘Whiplash’. You will never see me using any other colour braid than dark or moss-green – I just don’t see the need for red, pink, electric blue or flourescent yellow braid sorry! Ebay here is again, the place where you’ll most likely find it available, and at the best price. I doubt I’ll ever buy another pair of wading boots – that’s how impressed I have been with these, sadly discontinued safety boots. But fear not, there are a multitude of almost identical boots readily available at a similar price (£30-£45) from stores such as Screwfix – just add studs from Snowbee at %.99 for a pack of 40. Most of these safety boots have steel toe caps and a penetration resistant mid-sole, in addition to being lightweight and lacking in bits of metal! 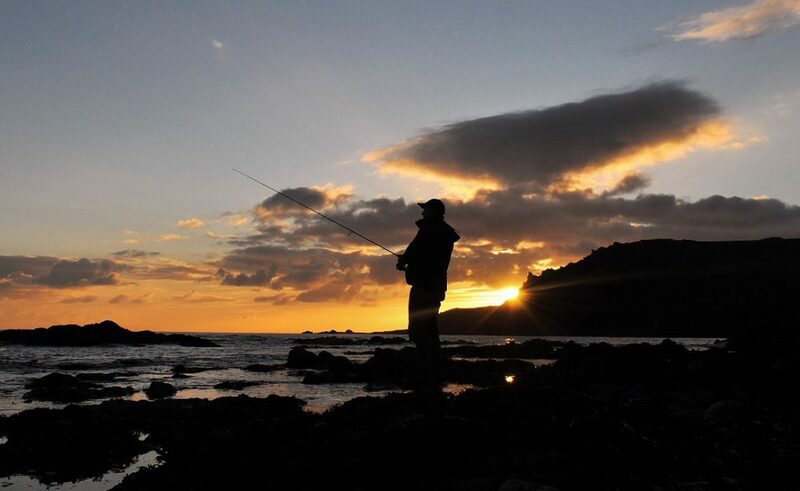 And when you consider their price in comparison to even the cheapest wading boots, there is simply no contest – particularly if many of your bass/lure marks involve standing on jagged rocks. To some, the silver blank and minimalist ‘Alien’ concept reel seat will be something they can’t quite get over. However, PLEASE do not let the design put you off! As beneath the aesthetics is an absolutely brilliant lure fishing rod. In terms of comfort, sensitivity, and casting ability the 8′ 6″ 7-28g and 15-42g versions compare favourably with anything I’ve used this season, including £500 rods – that is how highly I regard this range. Fot the record, Savage Gear have never asked me to write anything about any of their equipment – the simple fact, is that the Salt CCS offers superb value for money (between £80-£90) and is the ideal rod for beginners, someone new to this area of the sport or indeed anglers looking to upgrade from a spinning rod to a ‘proper’ lure rod. What is telling, is that every single one of my clients who has used one, has loved them, and most have actually bought their own! Weighing between 130-145g they feel incredibly light in your hand when coupled with a 2500 or 3000 size reel – don’t go any larger. Length wise, I know many lure anglers prefer a 9’ or 9’ 6” rod to possibly reach longer casting distances or to manoeuvre hooked fish, but I stick to my I belief that an 8’ 6” rod offers the perfect compromise. The only place I can find them still for sale is here. A very innocuous looking lure with a funny name! These weedless soft plastic beauties have been one of the finds of the season for many bass/lure anglers – and I’m one of them! What bass ‘think’ they are is open to debate – a small fish, cuttle, squid who knows? But what I do know is that this is one lure that 100% needs to be in your lure box in 2018. At 5” long and weighing 14g, they are extremely versatile in that they cast well and can be retrieved through practically anything (if required). Rigged on a large 6/0 weedless hook which is my preference, on a slow-medium straight retrieve (no twitches) they will swim in a ‘slalom’ manner in the top 6 – 12” of the water column. You get six in a pack and are available to purchase here. The Pearl colour has been very consistent in darkness. It was a close run thing, but the number one item of equipment I’d recommend from 2017 are the Jim’s Lures handmade, level sink needlefish. Coming in 15g and 18g guises and measuring 150mm, the designer and builder (James Lanfear) was kind enough to send me some at the end of 2016. I did use them sporadically in fast running tides from headlands etc and knew they had potential. However, it was after witnessing a client catch five bass (up to 62cm/5lb+) on one of Jim’s ‘Needles’ that they became one of my ‘banker lures’ during those balmy summer evenings when I’d often get to bed at 0300! At times, the bass would just hammer them continually! And I don’t know why, but I’ve just got an inkling that if I were to catch a double figure bass, it is going to come on a needle in darkness – as they do sort out the bigger specimens it seems. The magic is in the way that they’re weighted, in that they sink very slowly and horizontally, meaning you can relax (slightly) when casting them out over very shallow ground (again, if required). They are very easy to fish with too, as all that is required is a straight, slow-medium paced retrieve to make them swim around 6” under the surface where they are sihouletted magnificently. The Jim’s Lures needlefish are available here. I’d like to wish you all a very Happy New Year, and hope that 2018 brings you happiness, prosperity and, of course, many more memories and friends made through fishing. Thinking of buying the above reel as recommended in your post. However I have a question. The gear ratio shown for this reel is 4.8:1. Is this too slow for spinning lures ranging from 10 -30g. I spin a lot for sea trout as well as bass and am wondering if the above reel suits this style of fishing. Interesting posts, enjoyed reading this. I’m looking for a braid for my spare spool for situations where I need a braid a bit more abrasion resistance. Have you tried the new 8 strand whiplash yet? Curious how that one is in terms of abrasion resistance. Thank you for the comments. I haven’t tried the 8 strand Whiplash yet – but as you say, I’m curious to see how it casts and handles the sharp rocks. I’m becoming less and less inclined to test out braid in fear of losing a good fish (I lost two that I think would have beaten my PB late last season when the leader went (gill plate I believe).